Summary: A change of year-end meant SYS1 had a second opportunity to impress shareholders with a bumper set of annual results. However, this time the group admitted recent trading had been “a little slower than expected” and the highly rated share price reacted accordingly. Still, the group’s executives remain confident about the long term and underlined their confidence by declaring a super 26.1p per share special dividend. I continue to hold. Click here for all my previous SYS1 posts. SYS1 had previously announced it would change its year-end from December to March, and these figures were the first to cover the new period. The group’s calendar 2016 results had already showcased an impressive performance, while a subsequent trading update then signalled further upbeat progress. In the event, SYS1’s reported growth rates within this statement were quite similar to those revealed for calendar 2016. For the twelve months to March 2017, revenue climbed 27% and gross profit — the firm’s “main top-line indicator” — gained 29%. Both advances would have been about 14% without favourable currency movements. SYS1 made up for the lack of any dividend within February’s results by i) declaring a final payout up 83% to 6.5p per share, and ii) announcing a special handout of 26.1p per share. The year-end change meant two of SYS1’s quarterly performances could be deduced. Revenue growth during Q4 2017 was 25%, or 16% adjusted for currency movements. The stated Q4 operating profit number improved by 8% — although the increase would have been 30% had the group not spent £210k to change its name from BrainJuicer. Profit progress during this quarter has not been as straightforward, although I am unsure whether the stated figures were affected by ‘one-off’ items. Either way, it does look as if SYS1’s performances on a quarterly basis can be a tad unpredictable. I suppose the positive here is that the business still expects to grow for the full year. To be fair, SYS1 has admitted for some years now that it remains dependent on ad-hoc client work that has “limited revenue visibility”. In particular, the group suffered a surprise revenue shortfall during late 2012 and was then forced to watch its earnings and share price crash 45%. SYS1 said back then that it remained “convinced of its long-term growth potential”, and sure enough, earnings and the share price have since recovered to much greater heights. Of course, the many references to the “long term” may be because the board is not as chipper about the short and medium term! You could argue SYS1’s underlying performance was better than its headline figures because the group continues to ‘run down’ its old products. 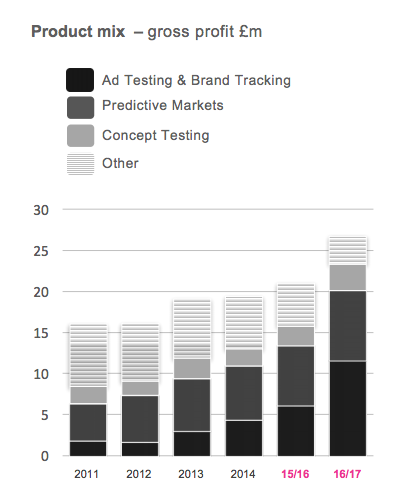 The chart above from the shareholder presentation outlines how the core divisions of Ad Testing, Brand Tracking, Predictive Markets and Concept Testing have expanded during the last few years. These latest results revealed the four main operations had lifted their combined gross profit by 47% to £23.3m. Something to bear in mind, though, is this line from the management narrative. No such caution was expressed within February’s 2016 results. The US continues to be SYS1’s largest market. Gross profit from the States improved 48% during the year and now represents 43% of group gross profit. Other overseas markets represent an additional 32%, and I trust such international exposure will be favourable to SYS1 should GBP remain in the doldrums. These latest results once again underlined the attractions of SYS1’s accounts. Cash capital expenditure continues to be more than covered by the depreciation and amortisation charged to the income statement. Meanwhile, working-capital requirements continue to be modest and for the last period produced a favourable inflow of cash. 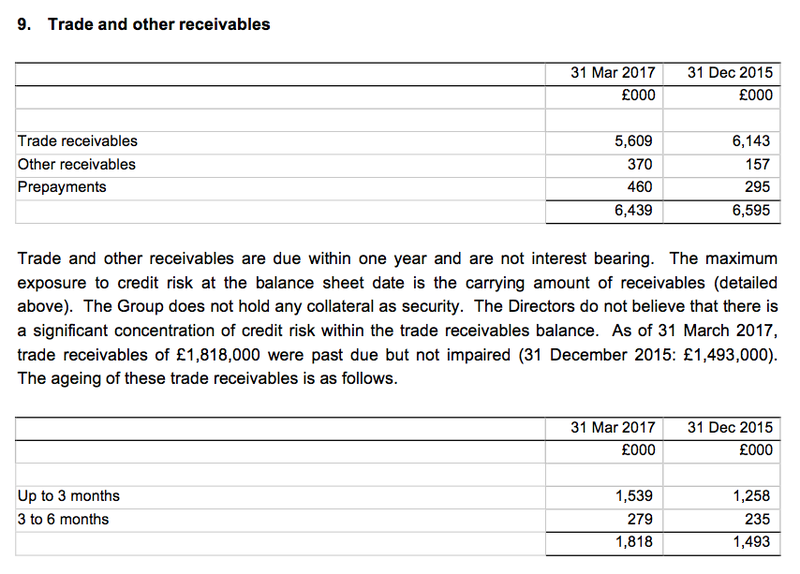 The super cash generation allowed £3.5m to be spent on buybacks, £2.1m to be spent on ordinary/special dividends, and £1.5m to be added to the bank balance. The £8.3m period-end cash position is equivalent to 67p per share and will easily fund the aforementioned 26.1p per share special dividend. Operating profit for 2017 (excluding rebranding costs of £210k and start-up costs for a new ad agency of £203k) came to £6.7m. After tax at the group’s 36% rate, earnings come to £4.3m or 35.1p per share. 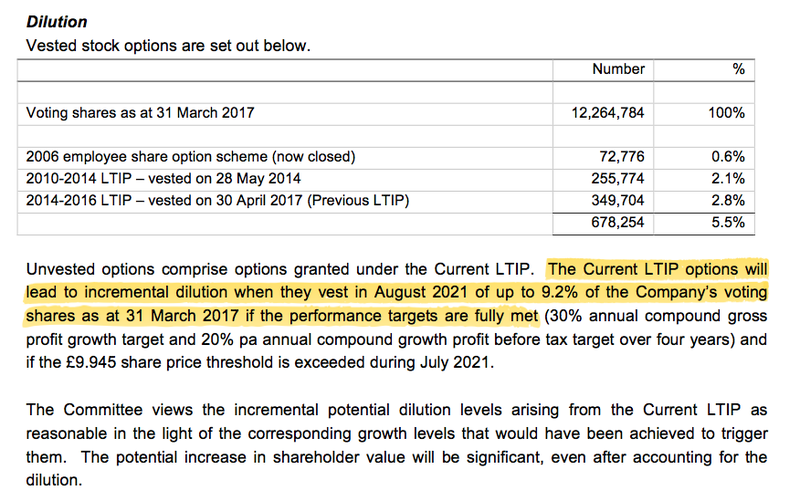 Adjusting the £93.2m (at 760p) market cap for the £8.3m net cash position, I arrive at an enterprise value of £84.9m or 693p per share. 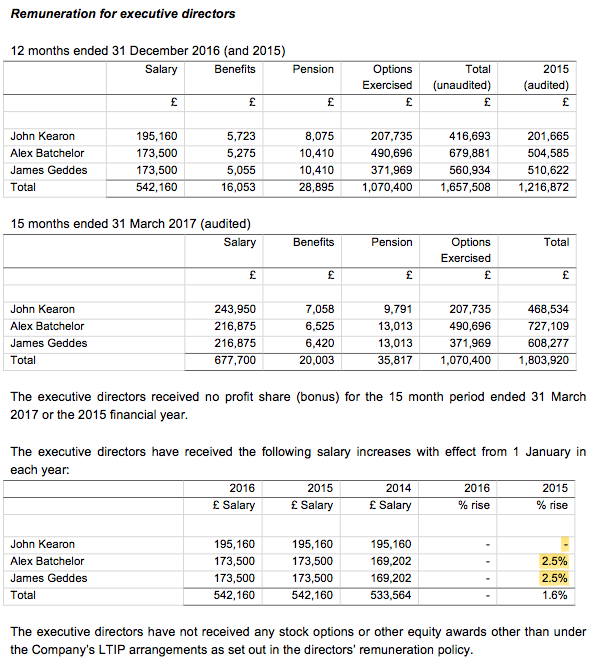 Then dividing that 693p by my 35.1p per share earnings figure gives a P/E of almost 20. I have to admit, that multiple could be vulnerable to a de-rating should SYS1’s slower-than-expected Q1 develop into something more untoward. In the meantime, the ordinary 7.5p per share dividend supports a token 1.0% income. Credit to SYS1 for publishing its full annual report within its results RNS. No encouraging people to be “bold” this year. A “lack of revenue visibility” has once again been stated. The 2017 annual report confirmed the outcome of the executive 2014-16 LTIP scheme and the finer details of the 2017-21 LTIP scheme. I had previously thought the percentage of stock options vesting would be 53% following an 18% EPS CAGR. I had not considered the remuneration committee would adjust the EPS figure and growth rate for the start-up costs associated with the ad agency. The details of the 2017-21 LTIP scheme were mostly disclosed when the LTIP was proposed in March. Where I have gone badly wrong interpreting this LTIP was believing “130% of the mid-market price of the shares” to mean 130% above the current share price. All of a sudden, the prospect of the executives growing the business so the share price moves from today’s 760p to almost £10 during the next four years does not seem that challenging. The only potential bonus the executives will receive during the next four years will be the aforementioned 2017-2021 LTIP. The percentage from this client has bobbed between 7% and 11% since 2010. Trade receivables as a proportion of revenue was 18% for 2017 — previous years it has been 24% or more. However, past due invoices did represent 31% of outstanding invoices — previous years it has been 24% or less. Maybe the change of year-end has had some minor effect here. Either way, the broader receivables picture looks quite sound to me. Revenue per employee came to £205k during the 12 months to March 2017, well above the previous £180k record set in 2010. On the flip side, the average employee cost came to £87k following various bonuses and was above the previous £80k peak set in 2010. At least employee pay as a proportion of revenue was 45%, which is in line with the 42-47% band seen during recent years. Awesome analysis. Thanks , Maynard. The slower than expected start to our financial year which we noted at the time of the announcement of our 2016/17 results on 15 June 2017 has continued since then, and we now expect H1 Gross Profit (our main top line performance indicator) to be 6-11% lower than prior year. This is mainly due to non-recurrence of large one-off Innovation projects as a result of some significant client spending deferrals and a more competitive market, although there have been some more encouraging signs recently. Meanwhile we are continuing to refine our Innovation product offering (Predictive Markets), with a relaunch planned in Q3 of our financial year. Notwithstanding this slow start and our lack of revenue visibility, we expect Gross Profit to move back to growth in H2. We expect that H1 2017/18 costs will be some 15% higher than last year. This reflects continued investment in senior hires in the US, which we referred to in our full year results announcement, to support future growth in both our Research and new Advertising Agency businesses. The H1 cost increase also includes one-off severance costs which will result in savings of around £0.5m per annum in H2 and beyond. Over the financial year as a whole, costs are currently expected to grow by around 10%. As of now, we anticipate a little over break-even in Profit Before Tax in H1 (prior year: £2.8m) and a decline in full year Profit Before Tax of approximately 10-15% from the £6.3m achieved last year. We will provide an update in early October, and a more detailed report with our H1 results announcement on 31 October 2017. I suppose this could have been expected given the mild Q1 warning contained within the annual results. There is also a certain irony with this warning. I attended SYS1’s AGM last year and asked about the year-end change (from December to March). I was told that the change was to help the business improve its internal budgeting and working processes, which in turn would help with the issuing of guidance to shareholders. Apparently, having a December year end, with by far the busiest quarter being October-December, had been creating a lot of problems. (A profit warning issued during 2012 was due to an expected strong calendar Q4 coming in a lot weaker than expected). So a March year-end would alleviate some of the pressure. So here we are now and facing an unexpected profit setback. 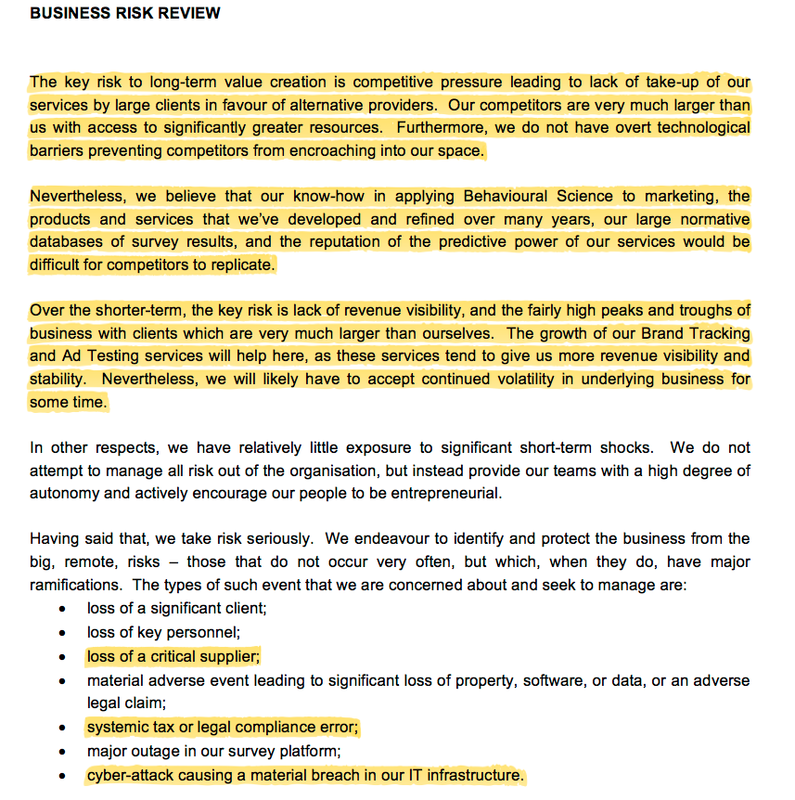 I think the underlying issue with SYS1 is that its business — as the group readily admits — does not have great visibility with regard to client activity and it seems to me that shortfalls can occur at anytime of the year. At least SYS1 has quantified the profit setback, although because of the year-end change, it’s impossible at present to directly compare the predicted H1 and H2 performances with the same periods from the prior year. However, some sort of rough comparison can be made. 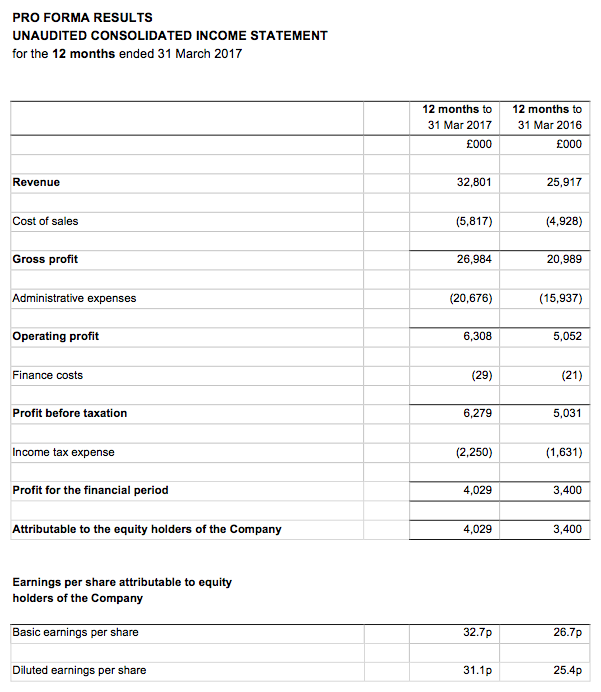 SYS1 says full-year pre-tax profit will be down between 10% and 15% for the current year (to 31 March 2018), so assuming a 12.5% setback, I arrive at £6,279k * 0.875 = a £5,494k pre-tax profit. The group says H1 pre-tax profit could be just above zero, so let’s say the H2 pre-tax profit is that entire £5,494k. I must admit, that is a very hefty H2 profit projection — in comparison, profit for the six months to 31 December 2016 was £4,562k. I suppose the reference to “deferrals” in the AGM text suggests SYS1 expects some H1 business to have shifted to H2. 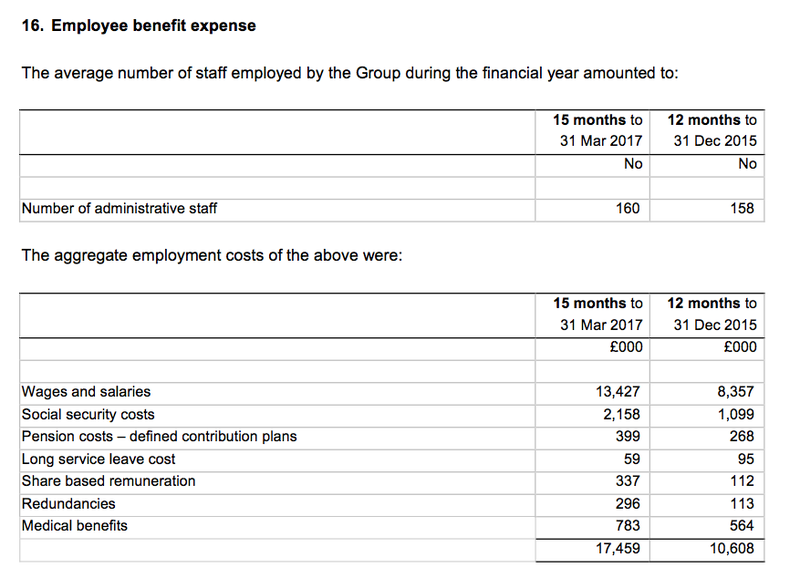 SYS1 says costs ought to climb 10% during the current year, so I calculate current-year costs will be £20,676k * 1.1 = £22,744k. That calculation suggests gross profit (SYS1’s main top-line indicator) for 2018 could be costs of £22,744k plus profit of £5,494k = £28,238k. That sum compares with 2017 gross profit of £26,984 — a full-year improvement of 4.6%. Again, that seems a bold prediction given the statement said H1 gross profit has declined between 6% and 11%. I think I need to read October’s results before acting on SYS1’s new projections. Until then, I still feel this company has a lot going for it. True, its income visibility is not great, but I do believe the entrepreneurial boss has substantial objectives for the group and offers the drive and personality to underpin his ambitions. The long-term history of worthwhile organic growth and frequent special dividends are other attractive features that indicate this latest setback — similar to the one in 2012 — will be short lived. PS Difficult not to like boss John Kearon in this interview from August. As announced on 18 August, trading in H1 has been slower than expected, and Gross Profit (the Company’s main top line performance indicator) is 9% lower than prior year (12% in constant currency), due in the main to non-recurrence of large one-off Innovation projects as a result of some significant client spending reductions and a more competitive market. Profit Before Tax in H1 is some £0.8m (prior year: £2.8m). We remain cautious about our prospects over the remainder of the financial year due to our usual lack of revenue visibility. The Company will announce its interim results for the six months to 30 September 2017 on 27 October 2017. H1 gross profit down 9% is within the 6% to 11% band indicated within August’s statement, while a H1 pre-tax profit of £0.8m is slightly above the projected breakeven. August’s statement suggested a bumper H2 could help produce a £5.5m pre-tax profit for the full-year. That may not be the case now. I await the results on 27 October for further details.